Marcos Highway is the main tributary of those coming from eastern Mega Manila (Marikina, Cainta, and Antipolo) towards Quezon City. The area is mainly a residential area so rush hours are jampacked with people . 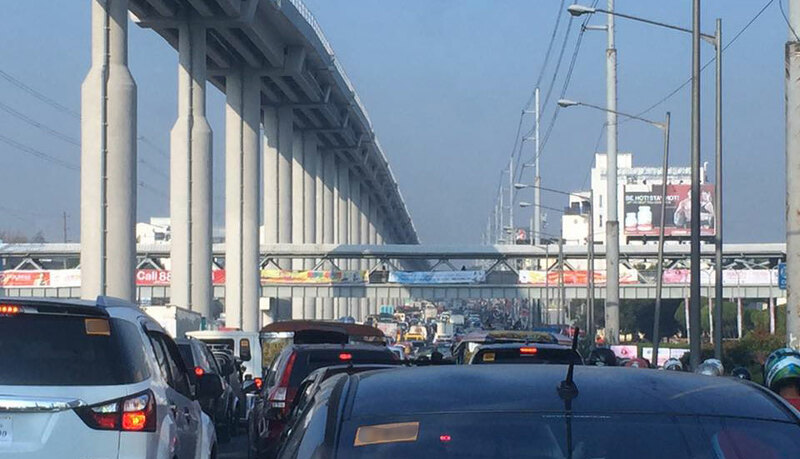 Yesterday Friday morning, the road was at a standstill for almost all of daylight when a truck collided with a LRT2 pillar near Sta. Lucia Mall. It didn’t help that the spot was at a major intersection – a major choke point in the area. The pillar was also still under construction and still had scaffolding. Rescuers and the LRT construction contractor had to be careful removing the truck from the scene fearing a collapse of the scaffolding. The collision left only two lanes passable backing up traffic all the way to Antipolo. According to an MMDA tweet, the incident happened around 4:21 AM. 1 person was killed and 2 were wounded. All were the truck’s passengers. Some speculate that the truck was racing another vehicle when it happened. It is unfortunate that a life was taken. Oftentimes, this gets trivialized by the rest of the people inconvenienced by the sudden traffic. Social media was abuzz with complaints of the traffic jam. Some had to walk to get past the choke point and others simply gave up and went home. Pays were docked. Appointments were cancelled. One incident affect lives of thousands for the worse. Taking a look at the comments on news sites and social media, there’s no shortage of contempt for what happened. Some are even as cynical as expressing disappointment that it wasn’t the driver who died. But such becomes the prevailing mindset when time after time we are affected by these truck-caused collisions and truck drivers and truck companies simply blame loss of brakes (which hint at poor maintenance) or reckless driving (which points to undisciplined and untrained drivers).